White fluff, a black button nose, and two bright eyes peered out of the dog crate on the floor of United’s cargo terminal. I cautiously opened the door of the crate and out bounded a 9-week old Golden retriever puppy, O’Rourke. “You’re gorgeous!” I said, and the freight handlers standing around agreed. 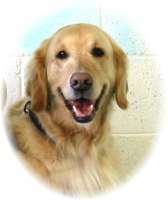 O’Rourke was my first puppy from Canine Companions for Independence (CCI). My husband and I had signed up to raise him as a service dog for the next year. From the very beginning, he was something special. Nothing seemed to faze him. He took everything in stride, calmly and confidently. Learning commands was a snap. When it came time to take him back to Oceanside, CA for his advanced training, we were assured that he would be successful and that he’d never come back to Colorado as a “released” dog. With lots of tears and tissues, we bid him farewell and good luck. Imagine our surprise, ten days later, when we received a call from CCI, telling us that O’Rourke had been released. Apparently, x-rays had revealed a tiny flap of cartilage in his left elbow which could potentially cause arthritis. Within minutes, my daughter (who lived in San Diego) was on her way to Oceanside to pick him up. O’Rourke came back to Denver and began life as a family pet. At 18 months of age, he had surgery on his elbow. He recovered quickly and has never taken a lame step, before or since. We had another CCI pup in training who went everywhere with me. Poor O’Rourke! He wasn’t used to staying home, with nothing to do all day. I looked around for something to challenge him and to make use of his training, his wonderful calm, friendly temperament, and his outgoing personality. Delta Society seemed to be the perfect outlet for him. In 1998, he passed the tests with flying colors but Delta Society was not well known in Denver at that time and we couldn’t find any facility willing to have him visit. It was very discouraging. 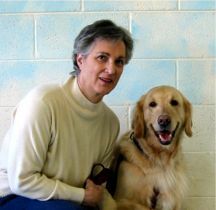 Enter Diana McQuarrie, and with her, the revitalization of Delta Pet Partners. O’Rourke began visiting Swedish Medical Center and seemed to have found his niche. He loved the attention and having a “job” to do. He seems to have a talent for relating to people. If the patient is frail, he tiptoes into the room and puts his chin gently on the edge of the bed. If the patient is more robust, he’s all wiggles and enthusiastic greetings. Just this fall, O’Rourke started visiting patients at Spalding Rehab Hospital in Aurora. 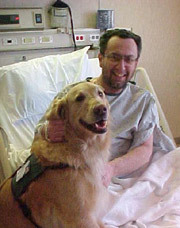 We’re hoping that he will eventually work one-on-one as a therapy dog with individual patients at Spalding. O’Rourke has also mastered the skills of a full service dog, including turning on lights, opening doors, picking up dropped items, and pulling a wheelchair. 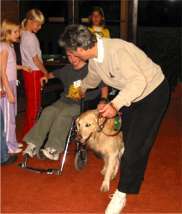 When Canine Partners of the Rockies (CaPR) was formed in March of 2002, O’Rourke became its “Demo Dog” and “Practice Partner”. In addition to his Delta duties, he works with CaPR applicants, teaching them the dog handling skills and commands they will need when they get their own service dog. Whenever CaPR is asked to do a presentation to a group, O’Rourke shows what service dogs can do for someone with a disability. And, quite frankly, he loves it! After he does his “tricks”, I usually let him off leash and he visits the members of the audience, making sure that they let him know how much they liked his performance. He’s a great ambassador for CaPR. O’Rourke has one other job. I continue to raise and train service dogs for CaPR, with the help of O’Rourke. Every one of the pups that has passed through our house has cuddled with O’Rourke. He’s like a giant security blanket for them. If a puppy is insecure riding in the car, O’Rourke goes along to provide a calming influence and a good role model. Our initial disappointment when O’Rourke was released by CCI has been replaced with the realization that he is actually touching many more lives than he would have as a service dog. O’Rourke makes a difference to many people on a daily basis.